The Honor View 20 is the world’s first smartphone that features an in-display front camera. The phone is currently available for pre-booking on Amazon. We are comparing it with Huawei’s flagship device Mate 20 Pro to see which one is more powerful when it comes to hardware? The Honor View 20 is the first smartphone by the Chinese company that features a 48MP sensor on the back along with a TOF 3D camera. The phone has a punch hole cut out at the front for a selfie camera, which gives you more viewing area. On the other hand, the Huawei Mate 20 Pro is the world’s first device with AI cinematography feature. The phone is water and dust resistant and comes with a triple camera setup on the back. Let’s begin with a quick specs comparison to see which is the best between the two at least on paper. Both Honor View 20 and Huawei Mate 20 Pro features a 6.39-inch display. 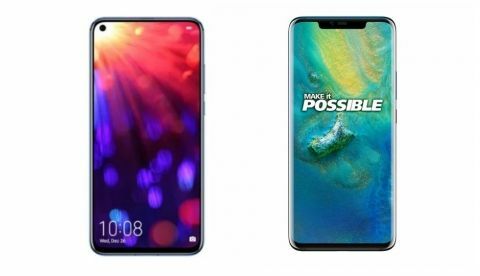 However, the Honor View 20 offers a resolution of 1080 x 2310 pixels, while the Huawei Mate 20 Pro offers a resolution of 1440 x 3120 pixels. When it comes to performance, both the smartphones are powered by a Kirin 980 octa-core processor. The Honor View 20 packs 6GB RAM and 128GB internal memory, while the Huawei Mate 20 Pro comes in 6GB/128GB storage model. The View 20 will also launch in 8GB/ 256GB variant. As far as the cameras are concerned, the Honor View 20 features a dual 48MP + TOF camera set up at the back, while the Mate 20 Pro has a triple 40MP + 20MP + 8MP rear cameras. On the front, the Honor View 20 has a 25MP sensor, while the Mate 20 Pro consists of a 24MP unit. 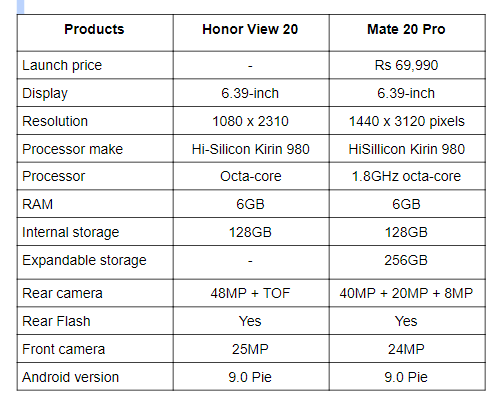 Interested buyers can now pre-book the Honor View 20 via Amazon and get free Honor Sport BT earphones. On the other hand, the Huawei Mate 20 Pro is expected to go on sale very soon on Amazon.